If you ask an Angeleno (a person living in Los Angeles) the distance between two places, you’re more likely to get an answer in minutes, not miles. That’s because there’s one thing all Angelenos have to contend with (deal with; handle): traffic. It’s common to sit in a traffic jam (where cars move very slowly) to travel just a few miles. Knowing this and knowing the usual traffic patterns (normal times when there are too many cars on the roads), Angelenos will figure that in (include that in the calculation; make that part of the counting) when giving you an answer. Me: How far is the shopping mall from here? My wife: It’s only 30 minutes. But there is one other way we talk about distance. 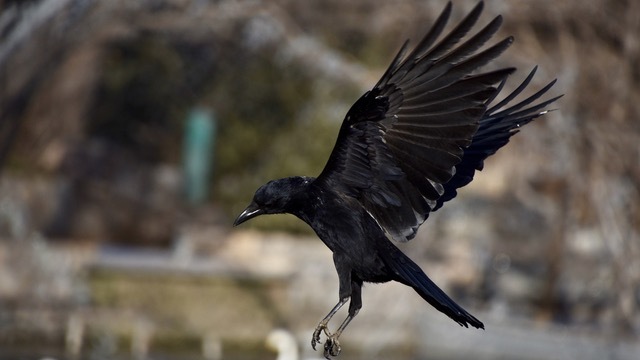 If I want to tell you the distance between two points without figuring in traffic OR the route (path) of roads, we can use a very common phrase: “as the crow flies.” A crow is a black bird (see photo). As the crow flies means directly, as though you’re measuring the distance on a map, in a straight line from Place A to Place B. My wife: As the crow flies, it’s only 10 miles. So if any Angeleno asks you to take them somewhere and tells you it’s only a “few” miles, make sure you get that distance in minutes. You might be spending the next hour in gridlock (with a lot of traffic on many connecting streets)!